Throughly wash kale & dry well. Pull leaves from stems & shred leaves by hand into bite sided pieces. Add to large salad bowl. In a small bowl combine the dressing ingredients, & wisk until blended. Pour dressing over kale & toss with tongs until evenly distributed, or “massage” with your hands if you prefer your kale to be more tender. 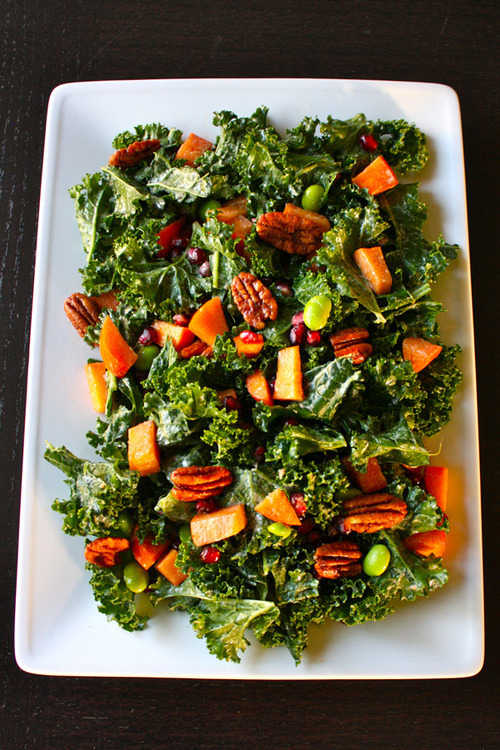 Allow kale to “marinate” while you prepare the rest of the ingredients. Cut persimmons into bite sized pieces ( prefer to leave the skin on) & deseed the pomegranate. Fold in persimmon, pomegranate seeds & edamame.Top with pecans.